In 2005, I moved to New York to head up the Entertainment Memorabilia department at Christie’s, New York. One of my first assignments was to go to Marlon Brando’s home on Mulholland Drive in Los Angeles to select property to include in an auction of his estate. What a job! I spent around 10 days at the house. By my last trip out there, we had gone through the house with a fine-tooth comb. We had discovered all his movie memorabilia in a bunker in the garden, including his annotated “Godfather” script. I really doubted that there was anything left at the house that would top that. The last room to check was Brando’s office. Along one wall was a bank of filing cabinets. We started to pull drawers out, finding old insurance documents, receipts for work done on his pool, that sort of thing. My heart was heavy as we sifted through more of the same. And then, tucked inside a file of unexciting correspondence, was a letter that appeared to be much older than everything else. I pulled it out, trying not to get excited, but there it was, a typed letter signed at the bottom in bold blue ink, “Jack Kerouac.” I nearly fainted. As I read the letter, it became clear that it must date from at least the late 1950s. The letter was a gem. 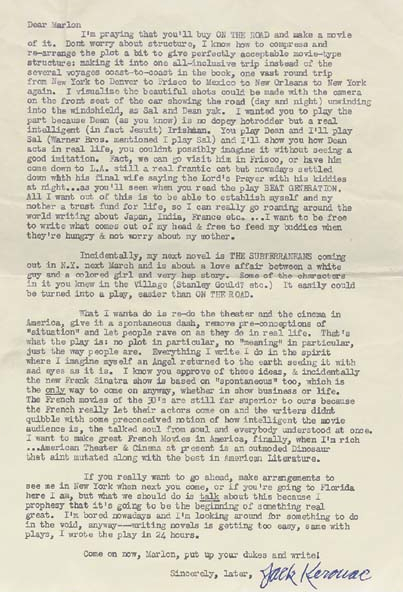 Here’s part of what Kerouac wrote: “I’m praying that you’ll buy ON THE ROAD and make a movie of it…. I visualize the beautiful shots could be made with the camera on the front seat of the car showing the road (day and night) unwinding into the windshield, as Sal and Dean yak…. You play Dean and I’ll play Sal.” Brilliant! I had found a one-of-a-kind letter between two of the 20th century’s most important and influential icons. The letter ending up bringing $33,600 at the auction, but my memory of finding it on that hot California day is priceless. Perhaps you could post a readably-sized picture of the letter? That’s as big as it gets. Hope that helps, tx! I was able to read it better by hitting (command)(+) or (apple)(+) to zoom in on my browser. (command)(-) zooms it back out. why didn’t Marlon do the movie? An entire legacy. An entire possible movement in film and theatre. All of that inexistent because of a pocket veto. I love Brando, but I would have loved to have seen America with “spontaneous” theatre. But who knows? Maybe its for the best. poor Kerouac he was probably so disopointed about not getting a response I no the feeling I made offers to people too about jobs an stuff never to hear a word Ilike Jack Kerouac a lot very cool guy. way before his time.